As the name implies, TMV sits within the mountains. 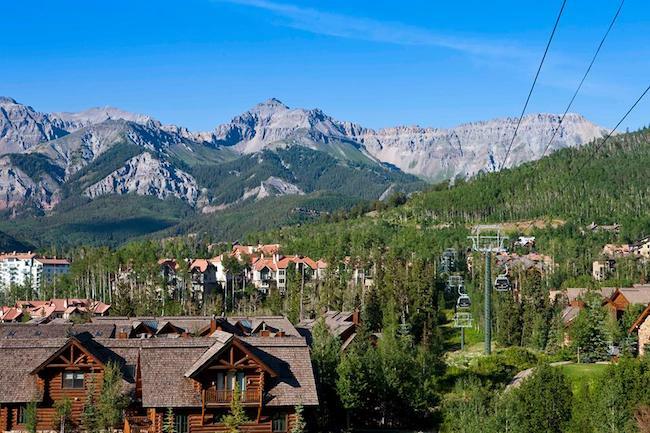 At the base of the Telluride Ski Resort in the southwest corner of the state, TMV adopted a free gondola and chondola (chair gondola) system as public transportation in 1996. Cars are still allowed in the town, but parking is limited to two garages and not permitted along streets or roads. The community prides itself on its efforts to eliminate carbon dioxide emissions through efforts such as the Mountain Village Gondola (or “G” as it’s known locally) and mandatory recycling, strong efforts at composting, and adoption of a Zero Waste Action Plan. TMV covers approximately 3.3 square miles with a good part of that area dedicated to “plazas” where much of the commerce and community events occur. Hotels and businesses line the plazas and planned open and green space provides venues for concerts, free outdoor summer movies, and festivals. Photo of the Town of Mountain Village courtesy of their Facebook page.